This entry was posted in Peasants and populism, Politics and neoliberalism by Chris Smaje. Bookmark the permalink. Congrats on finishing a first draft! Must feel most refreshing. And now to the tedium of screwing it down tight. Good luck. That sentiment alone might be sufficient for a comment; but why waste the bandwidth? I’ve enjoyed getting a first hand peek at what Brexit means to a Brit. I know only a very few other Brits (still living on the island) so much of what I get here in the States has to be filtered through our media – such as it has become. I’ve tried to some extent to also gauge these developments from the perspectives of citizens on the opposite side of the Channel. This strikes me as watching an old couple work through a messy divorce. The quibbler in me is curious about a view you’ve stated: As an economic power bloc the EU, like the US, is a malign force in global agriculture Do you really think ‘malign’ fits the situation well? I’d grant that in my role, minor as it really is, I do feel somewhat slighted by participating in a malign force… so perhaps I’m not being as open minded about it as I might otherwise be. But apart from any personal feelings on the matter, I also wonder about the factual nature of the assertion. When I consider agricultural production statistics, grain flows, global market responses, and political conflict impacts on agricultural prices I seldom see the EU (with or without the UK) being much of a concern. The BRICs, and yes, the US… Africa (for different reasons); South East Asia outside of China, Argentina, and even Australia and New Zealand sometimes; but the EU? From my perch the EU is a great customer – a customer for whom those mentioned above fight to satisfy. Sure, there are very significant agricultural sources within Europe. But I don’t have the sense they malign any international efforts to agriculture on the planet as a whole. …it also seems probable that Brexit Britain will open itself up and align itself regulatorily with the USA. “Chlorinated chicken” is already a phrase in the public consciousness. We ain’t seen nothing yet. This may qualify as a cogent concern. [As I read the last sentence there I could hear in my head a melody from the Who – We don’t fooled again… ] But before gainsaying anything about US food regulatory matters it might be well to consider how the history of ‘mad cow’ has played. Here in US when I go to the Red Cross to donate blood they want to know how many months I’ve spent in the UK and Europe over the last many years. If too many, they don’t want my blood. It’s all very curious. There is another new book about to be released (in a week or so I believe) by John Gusdorf titled Ecological Living and the curious can easily find much about it through their favorite web search software. I bring it up here because from the little I’ve looked at thus far I think John makes some good points. The present international political malaise may well play out to smaller and smaller scale polities having more and more to say about day to day life. This, for me, envisions a future where farms could well be much smaller. And thus ripe for a prophet from the southwest of your island. IMHO the EU has ben an unmitigated disaster for british farming , EU regulations closed down much of the local farming infrastructure , slaughter houses , small dairy farms , small milk processing plants all to the god of stainless steel and so called ” food safety ” , food processed in the mega plants poison a hell of a lot more people than the small local factories , public health authorities have to chase all over the country to find contaminated food from one giant factory . The free market made my hair stand on end .working for one of the food “giants” I went to farms in Poland , Italy and Spain , where milking was done by hand into buckets , tipped into churns taken to the rail station and sent to the UK in tankers , the EU was told to ” piss off ” or took a bribe to turn the blind eye . Organised crime found a new cash cow . Financially the EU is a zombie Deutsche bank is in a worse state than Lehman bros , Germany can find 2% of its GDP to fund its military , France seems to be heading for a new republic hopefully without a civil war , Italy wants out and Spain looks like electing the first right wing government since Franco , all of which is is ignored by the happy happy joy joy from Brussels and their cheerleaders in the UK media ,the captain of the titanic would be proud of them . This is two weeks old, and does show DB having a tough 2018. But one graph on credit default swap exposure at DB shows their risk declining a bit now in 2019. I’m not a financier by any stretch, so if Daz has some other intel he might share, I’d love to see it. Yup Lehman is gone but its demise started the QE debacle that can not be done again , that debt is still hidden on central banks books , and the casino banking that caused the problem was not put an end to , it just accelerated derivatives are estimated at between 40 and a1000 % of world GDP , DB is probably the weakest and most exposed to a world downturn . DB derivatives portfolio is bigger than the total planetary GDP , its too big to fail and too big to bail out though I am sure the politicos will find a way of off loading its upcoming collapse onto the poor bloody taxpayer . Should read Germany CANT , find 2% of GDP . I don’t think it’s safe to assume that bigger crises will call forth wiser heads. Brexit is not yet a crisis, so far we have only planning for crisis avoidance, something that people do very poorly. If people were good at planning for crises SFF would not exist. There would be only 500 million of us earthlings, who would already be living on small farms (or most of us anyway) and the earth’s climate and ecosystem would be in glorious equilibrium. When the real Brexit crises come, lack of meds or food, for example, I suspect that “wiser heads” will figure out a way to help mitigate it. The powers-that-be in the UK will get a long master class in crisis management. Let’s hope they get good at it. Is there such a thing as wiser heads anywhere amongst UK politicians ? Honestly there aint one of them that could sell ice cream to arabs or find truth in a dictionary . They have no experience of running a independent nation , Whitehall has become a glorified town hall run by counselors not statesmen . Cant see there being med shortages most are made in china , food ? Nope the ability to buy food from all over the world opens up when the eu is no longer meddling Liverpool will replace Dover . On US regulatory frameworks, in view of my comments above you’ve set a cunning trap with your BSE example to prompt my nationalist outrage…so I’d best not bite. As I understand it, and I’m certainly no expert, there are significant differences between the US and the EU in terms of things like GM crops, prophylactic antibiotics, animal confinement standards and pesticide regimens. I’m not inclined to take a particular stand on this or debate it at length right now, but I’m interested in any views. Certainly seems to be a worry among UK farmers in terms of a US trade deal. Joe – interesting points. Ashley Dawson’s book on ‘Extreme Cities’ that I’m currently reading is interesting in arguing that national and state level politics in the US (and elsewhere) have become theatrical and hyperreal, while city-level politics takes the strain – eg. Florida’s governor disputes the existence of climate change while Miami’s government is busy trying to figure out how the city will keep above the water. I share your hope that central politicians will get good at crisis management – I fear that they won’t get good enough, soon enough, if at all. On the first point – Ag import tariff heights – yes, self defense mostly. Food independence is even more important than energy independence, so this is a natural stance for most governments. I do need to thank you for pointing to the cotton situation – hadn’t heard about that yet. Will have a look. I’m not against tariffs – on the contrary. But I’m against applying them unfairly on the basis of economic power – both between countries (core-periphery) and within them (landlordism). I’d be interested in any thoughts on it…especially ones from US folks. Unfortunately, the described damage to rural communities is part of the externalized costs of “cheap food”. 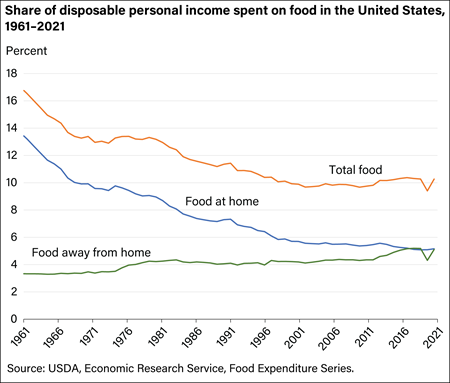 Back in 1960, Americans spent an average of 17% of their disposable personal incomes on food. By 2000, this had dropped to around 10% for all food (and around 6% spent for food at home, the lowest in the world). The UK, Ireland, and Canada also rank among the lowest percentages of income spent on food. Consumers are voting (with their dollars, or pounds) for “cheap food”, and government policies enable the externalizing of the real costs. The continuation of the trend of agricultural mechanization will continue until the energy for the machines runs out. We are nearing a situation in which most farming needs so few people that almost everyone will live in cities and machines will rule the countryside. A few “artisanal” farms may exist near cities, but the proportion of calories they provide will be minimal. The substitution of machine for human labor has been going on for a long time in every economic sector in the rich world, not just agriculture. We see it in mining, forestry, construction and even in retail (Amazon is just a big constellation of machines after all). If it goes on long enough, there will be little for people to do but entertain themselves. When the process reverses, either from energy depletion, climate change or unmanageable complexity, it will be an extremely rapid and catastrophic reversal. I applaud SFF and others who want to counter this trend and help provide for a softer reversal process, but time is running short. I’m not sure I’m seeing this issue in the same light as Chris (Food Giants Swallow Family Farms – Iowa). There has certainly been a very serious level of consolidation in the livestock industry in the US. It has been going on for decades. Indeed Steve L points to the result of all this consolidation – falling prices for consumers. The ‘Get Big of Get Out mantra’ of Earl Butz (Secretary of Ag under Nixon) was taken to heart by the animal ag sector. But there has been a bit of irony in all the consolidation as well. For instance – here in the US there are now 4 major players in the meat space. Two are now foreign owned [the players are Smithfield, owned by a Chinese corp; Swift & Company, owned by a Brazilian firm; Tyson; and Cargill]. The observant will quickly realize that China and Brazil are the more significant of the BRICs… who someone here mentioned earlier as global Ag players to pay attention to. It is worth noting that China plays in this space primarily for her own consumption. The US and Brazil are obviously also feeding their own people, but each of these latter two also trades heavily in the international Ag space. So if I understand the fretting of UK animal industry folk – in Brexit terms where negotiating with the US is a foreboding possibility – it should be through a lens that sees the wider global infrastructure (ownership). Small comfort perhaps, but if one also notes the environmental harm done by CAFOs here… inexpensive meat imports to the UK could come without the costs of ruined streams and lakes on Her Majesty’s Island. Here I’d like to venture beyond my local pool and inquire of our Wessex farm hand and small farm prognosticator… what of the food retail business in the UK? I hear of Tesco, Sainsbury’s, and Aldi’s (we have Aldi’s stores here) and I wonder about their corporate situations. If, as suggested by the Guardian in the subtitle, these massive US and BRIC livestock corporations are eyeing a post-Brexit UK market then who wins, who loses, and what might be done before any of this comes to reality? What have Tesco et al. said of Brexit? In closing I might also offer that the industrial livestock sector here in the US is not calling all the shots. https://www.npr.org/2019/01/10/683847157/court-strikes-down-iowas-ag-gag-law-that-blocked-undercover-investigations is a piece from January of this year. It is complicated. I think the animal welfare laws will make it far harder to run a CAFCO system in the UK , the near ban of using antibiotics in the UK, though their use is almost universal in the USA , I keep a few animals /chickens here in TX , antibiotics are found in all the compound feeds I used , you have to buy straight ( corn oats gluten et al ) and mix your own or pay through the nose for so called ” organic ” feeds to get away from antibiotics . I wasn’t linking the Guardian article specifically from a Brexit angle – I was just interested in thoughts on it. Thanks for those. Joe’s right about the march of the machine, though the demise of the small farm has been heralded many times, and hasn’t quite happened yet. In fact, in the UK and I’m guessing in the US too small farms by most reasonable definitions are in the majority, though of course that’s partly an artefact of their size. Their calorific contribution indeed is small, but their sociological significance is bigger. Not least in relation to Joe’s point about people entertaining themselves, since our political economies haven’t yet figured out how to pay people enough to entertain themselves adequately when they’re not working. Here we face an endogenous crisis in the political economy even leaving aside energy and climate change issues. In poorer countries, small farms are yet more important for absorbing labor – there are issues of labor…and also fertilizer…equity here that I’ve been writing about a little of late, which would be of interest to discuss on here. Clem’s right that the food retail sector here in the UK is highly concentrated. My sense is that the farm sector is less so – we have what amounts to CAFOs for pigs and chickens, though smaller ones than in the US. Sheep, beef and dairy farming is mostly smaller scale family farming, though it’s hanging on by its fingertips. Whether in a Brexit situation we turn to a more corporate farmscape or a nature-conserving one with imports of cheap meat is still up for grabs. I haven’t heard too much from the big retailers about their stance on Brexit, other than short-term worries about supply chains. Maybe I haven’t been looking hard enough. I’m guessing that they don’t care too much where the food comes from. If we do effect a hard Brexit it’ll be interesting to see how much the nationalist narrative of ‘taking back control’ translates into farming. Not much, I expect. On Daz’s points about subsidies, these go disproportionately to large-scale farmers, and in fact ultimately go to retailers and consumers, not so much to farmers. I’m hoping to post some more soon on various other issues, but the book-writing is going to be a big time drain through the spring and summer so forgive me if the posts remain sporadic. Thanks for continuing to stop by. I should have made myself clearer , the subsidies are just a way of keeping down food prices by stealth , the cost of the government department that doles out the money and the subsidies themselves come from taxes , that should be calculated into the price of foodstuffs , yes the big boys get the lions share that could be easily capped . Subsidies in US agriculture are an interesting and complex study. Chris and Daz have motioned toward some of the beneficiaries… and missed a couple. On Daz’s points about subsidies, these go disproportionately to large-scale farmers, and in fact ultimately go to retailers and consumers, not so much to farmers. And he is correct that the subsidies work their way through production ag and ultimately benefit consumers by keeping food prices down. There is a benefit to land owners who do not farm in that ag land values and rents are higher because of the subsidies. Farmers who are owner operators gain the same benefit on their owned acres, but a portion of the subsidy evades them on land they rent. yes the big boys get the lions share that could be easily capped To which I’d reply that the “big boys” (which will include some “big girls” to be fair) are in fact capped. Next one can grumble that the caps are not tight enough. I’ll not go there right now. The cap I’m most familiar with is a taxable income limit. A farmer (male or female, white or other shade) that has a taxable income greater than a set amount is not eligible for subsidy or has his subsidy curtailed. Take away – caps do exist. Here is a piece from 2016 (from the USDA) that shows some of the stats. To Daz’s point though – only some of the “big boys” actually get capped. But subsidies here in the US abound all over the economic frontier. Share holders are subsidized, home buyers are subsidized (and landlords also gain in the home owner subsidy because of increases to land values and rents – just like in the ag example above); Seniors, Students, low income folk, it goes on and on. Picking on farmers (at any scale) is missing the larger matter. Its no only direct subsidies for crops , theres a plethora of other ways farms are subsidise , all of which need to be added into the costs of foods , want a new fence no problem , a new well , also no problem , those are two that have happened in this county since the new year , if you have a ag exemption the road tax on your pickup is $5 ( $85 ) if not , same for a trailer $5 with the ag $85 without , thats three off the top of my head . I couple points on agricultural subsidies I would like to add; Ask a conventional farmer how much he spends per acre on NPK, herbicides and pesticides and how much they receive in subsidies per acre. They’re won’t be much difference. So who is being subsidized? Industrial agricultural has been designed to maximize the use of oil and its products, which has been very profitable for those interests. The massive use of oil has displaced 95% of the agricultural labour force, the subsidies enable what is left of the labour force to continue to buy the diesel, NPK, herbicides, pesticides and big machines each year that otherwise they could not afford, and they are still going bankrupt at a good clip. American has cheap food because they sacked 95% of the labour force. The income of farmers has been stagnant for many decades, but only 5% of the farmers have to be paid these days, that is why food is cheap! Secondly, its not the subsidy per acre that makes the difference its the size of the lump sum of cash when the subsidy is paid out that does. A big cash sum for a large farmer enables them to pay cash for big machines, livestock or extra acres, while a smaller farmer would have to go into debt. Its the weight of debt that makes the difference between staying in farming or not. I fine idea, so I asked myself. My answer is that it depends upon the crop I grow. For corn in Ohio subsidies look to be almost half, for soybean the subsidies are closer to even. Corn requires more inputs. You didn’t include seed on your list, which puzzles me (for if you want to assign P & K as somehow the proceeds of the oil industry, then seed might be added by same logic) . Adding seed to your list pushes the subsidy significance even further from parity (especially for corn). Still, your point that farm input suppliers benefit from subsidies makes a little sense. Industrial agricultural has been designed to maximize the use of oil and its products – Gotta complain about the logic on this one. Oil may facilitate industrial ag. but to claim this is a design feature is incorrect. High Plains wheat production was very industrialized before the advent of oil. Oil has merely greased the way. Still, the extent to which oil plays a role is worthy of note. There has been a very serious decline in farm employment over the last hundred years or so. Your 95% figure, however, seems too high to me, do you have a reference? Your point about the significance of per acre subsidy vs. total size of a payment puzzles me the most. If you could flesh that out a bit more I’d be grateful. It seems you’ve jumped from NPK, herbicides, and pesticides, to giant farm equipment, and other investments. In the market where I work we can only spend a given dollar one time. Finally – to your assertion that weight of debt makes the difference between staying in farming or not… I would observe that debt can be both friend and foe. How one manages debt is more important than its existence. Weight of debt – in the context where it occupies too much of the balance sheet – can be problematic. But this is a management issue. There are many other features of the agricultural enterprise that impact one’s ability to remain in farming. Weather, markets, opportunities outside of farming are just a few. The first two mentioned there are risk factors that can be managed to a certain extent (as the debt issue). Combinations of risks occurring simultaneously can be devastating. Opportunities outside of agriculture can appear to be more secure, less risky. There are numerous reasons for the declining numbers of folks on the land engaged in farming. To lay them all off on oil or the subsidy system is a stretch to my mind. Interesting piece on the environmental costs of feeding europe . The words ” allow and give ” kinda smacks of Stalin .